KSCCL Notification is out. KSCCL is recruiting for 46 Various Post Govt Job Posts. 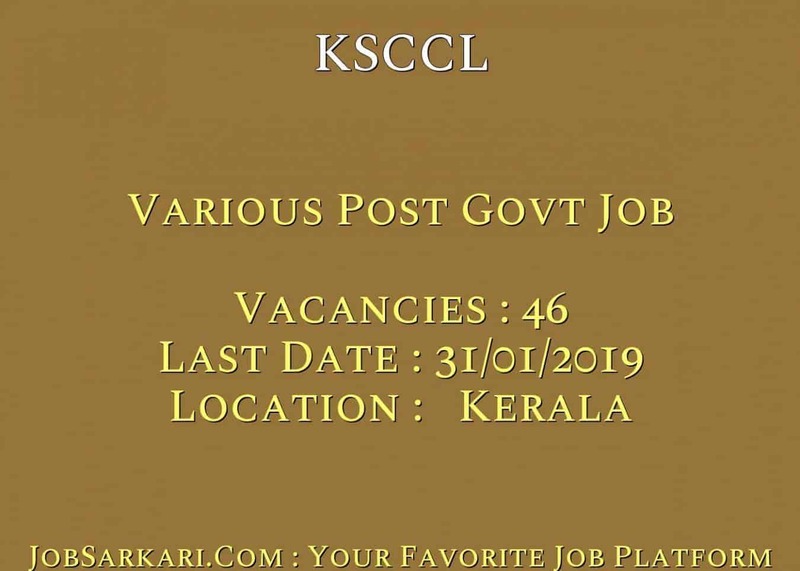 You can check KSCCL - Kerala State Construction Corporation last date, download KSCCL notification, visit KSCCL official website and check other KSCCL Vacancy details.Complete Vacancy and recruitment Details about 46 Various Post Govt Job vacancies in KSCCL are provided below by JobSarkari.Com only for you. Last Date of Apply Online. 31/01/2019. Project Engineer. Candidate Must Have Passed Degree in Civil Engineering With 10 Years Experience in Related Field. Retired Govt. Employees With Diploma in Civil Engineering and Having 15 Years Experience in Related Field. Max 60 Years. 03. Assistant Project Engineer. Candidate Must Have Passed Degree in Civil Engineering With 7 Years Experience in Related Field. Having Diploma in Civil Engineering With 15 Years Experience in Related Field. Max 60 Years. 10. Engineering Assistant Gr.I. Candidate Must Have Passed Degree in Civil Engineering With 1 Year Experience in Civil Engineering Works. Max 40 Years. 15. Engineering Assistant Gr.II. Candidate Must Have Passed Diploma in Civil Engineering With 1 Year Experience in Civil Engineering Works. Max 40 Years. 17. Engineering Assistant Gr.III. Candidate Must Have Passed ITI in Civil Engineering With 1 Year Experience in Civil Engineering Works. Max 40 Years. 01. 5. Upload the scanned Copy of Documents in the Prescribed Size and Format. 6. Online Application Can be Submitted On Or Before 31st January 2019. Q. What is the Last Date For KSCCL Various Post Govt Job Vacancy ? A. 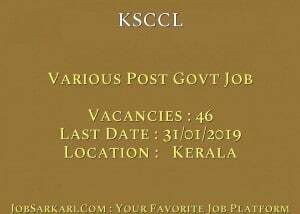 Last Date for KSCCL Various Post Govt Job Posts is 31/01/2019. Q. What is the Form Type of KSCCL Various Post Govt Job Recruitment ? A. The Form Type for KSCCL Various Post Govt Job Posts is Online. Q. How many vacancies are available in Kerala State Construction Corporation Various Post Govt Job Posts ? A. There are about 46 Vacancies in Kerala State Construction Corporation Various Post Govt Job Posts. Q. What is the Full Form of KSCCL ? A. Full Form of KSCCL is Kerala State Construction Corporation .